El restaurante Sheriff pone orden en la urbanización Las Buganvillas playa, perteneciente a la malagueña localidad de Mijas Costa. Una oportunidad de cocina mediterránea que se aprovecha de un enclave con vistas al mar inigualable. La carta del restaurante Sheriff contiene un gran nombre de entradas con sabor a mar. Desde Gambas al pilpil hasta coquinas, almejas y mejillones. Entre sus especialidades más destacadas, brillan con luz propia el Pollo al curry, la Dorada a la sal, la Paella mixta y la de mariscos y el Solomillo de ternera a la plancha. La oferta culinaria del restaurante Sheriff se completa con un menú infantil, pastas y pizzas, cosa que lo hace la mar de familiar. Y como no, con el permiso del sol, poder disfrutar al aire libre de la playa y de su playa se erige en un sueño fácilmente realizable. ¿Necesitas más motivos? A gem of a place, set on the beach, hidden from the main road with uninterrupted views of the sea. Good food & friendly service. Dinner on the beach beautiful .we had fish salads for starter it was good , My husband had Sole it was so good .looking forward to returning . Great location, relaxing views. Service is poor and attention is lacking. I would not go back for the food but may return for a beer. A pleasant location situated on the sea shore. Attentive service, a friendly relaxed atmosphere in the restaurant. 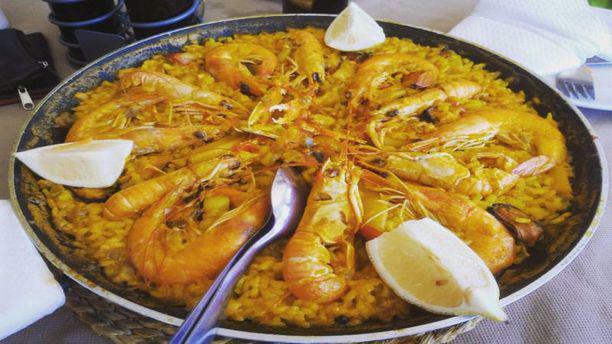 The food overall in our group of diners was well cooked, albeit the seafood content in both, the seafood salad (starter) and seafood paella (main course) could have benefitted from additional seafood content being included (eg mussels, calamari, selection of fish). However the other dishes served were very good. really good food and amazing service. We had a very nice evening in an excellent atmosphere. The food was brilliant. The team was nice and funny. An everyday-option for a remarkable evening. Perfect service with one of ghe best seatings at the Costa del Sol. Lovely meal in great tranquil location with the sound of waves crashing throughout the mealtime. The service was perfect and the food was really good. We ordered various main courses and starters. Everything was good. The seating is one of the best along the coast.